Jumping is great fun for both horse and rider and demonstrates great athletic ability. 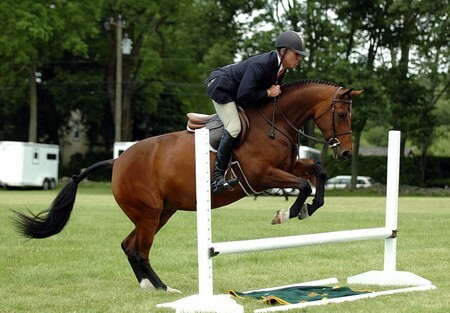 Teaching the rider or horse to learn how to jump should be done in gradual stages. If either are pushed too much too soon, the rider is likely to become frightened and the horse will lose confidence and start to refuse. Pole and gridwork enables a horse to start judging distances and is particularly useful for helping young horses to learn balance and rhythm. If you are not familiar with setting out gridwork, ask an experienced rider to help you or have a lesson with an instructor. Place three or four poles at an equal distance apart down one of the long sides of a school. Place a single pole on the opposite side of the school. Walk over the single pole. The first time you do this, the horse, especially if young, may want to look at the pole. Allow the horse to lower its head while encouraging it to keep moving forward with your leg aids. Walk down the line of three poles. If this is successful, go into trot and proceed over the single pole once again. Now trot down the line of poles. On approaching this line, do not allow the horse to study the poles too much but encourage it to go forward actively. Once you and your horse are confident over the poles, ask an assistant to make a small cross-pole jump with the last two poles. In trot, practice your approach and striding into this. Make sure that you practice these poles on both reins as it is important that both horse and rider develop suppleness in both directions. Once you have a small grid of poles set up, place more poles around the school with a selection of cross poles at the end of the grid. Work this into a small course, maintaining trot throughout. If your horse rushes its jumps, gridwork is an excellent way to encourage the horse to slow down as it approaches the jump. Place three trotting poles equal distances apart followed by a small jump, possibly at about 2 ft (60 cm). Approach the jump in trot. If the horse starts to rush, do not interfere with its mouth by pulling on the reins as the poles will act as a natural break. After you have gone over the last element, continue in canter for two strides before returning back to trot.